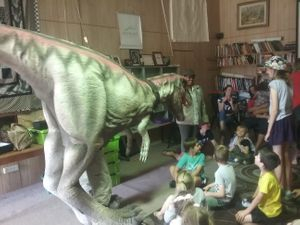 What you can see and do for family fun! Pick your own strawberries start in mid October and go through to late May, depending on the weather. You can bring your own fairly shallow container (not a bucket or they'll squash!) or we can provide one that you can recycle. Cost is $16 per kilogram and you pay for what you pick by weight. 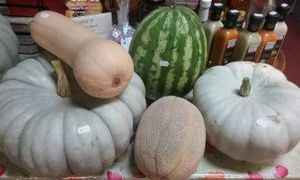 We don't allow eating the fruit in the patch, just a taste of one when you begin. There is no entry fee. We have a 9 hole mini golf course which has some challenging holes, so quite competitive for some families! Mini golf is a great activity to include in a child's party. 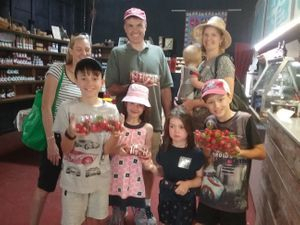 Have each child pick a small punnet of strawberries, mini golf, an ice cream, a self-guided walk or bike ride along the bush tracks for $10 per child. Allow a maximum of 2 hours, that's long enough for everyone! We have a range of jams, sauces and pickles made by Peter in the farm kitchen from our own and locally grown produce. The range includes traditional preserves with sugar and sugar free sweetened with xylitol. Go to the Homemade Jams and Sauces page for details about the range. These are also available to buy at the Online Shopping page. 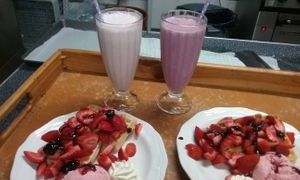 Our Everyday Menu includes Strawberry Sundaes and Waffles, strawberry ice cream and milkshakes, Harvester's Lunches (bread, meat, cheeses, fruit, pickles), tea, coffee, hot chocolate, iced latte, scones with jam and cream. 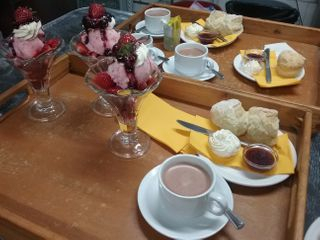 We cater for pre-booked groups with lunch or dinner of a buffet of cold, hot roast or barbequed meats and salads and strawberry sundae dessert. We have your drinks covered with beers, ciders and wines available at bar prices. Go to the Farm Cafe page for details on menu and prices. 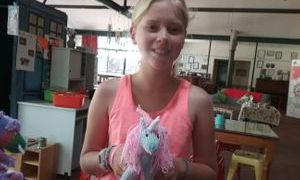 Marg started knitting Belstackasaurus in 2017 and now has made over 200 - all individual, all named. The children at school where she teaches help her choose the names. Adult Belstackasaurus are $40, babies are $25. Pocket pets include unicorns, dogs, elephants, giraffes, crocodiles, tigers - anything really! Granddaughter Angel knits owls and turtles. Contact us to order. Marg also teaches knitting with classes for people 10 years old and over. Book in at the Online Shopping page. Follow us on Facebook to find out what activities are offered this school holidays. 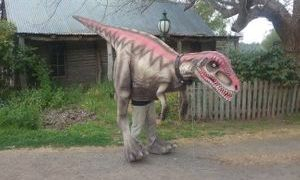 In the past we have had Bush Art, a visit by the Dino Rangers, Scone Making classes, Dinosaur and Fairy Treasure Hunts. 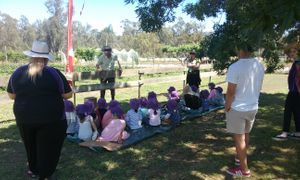 From kinder to Year 12, our program teaches paddock to plate, sustainability, health and nutrition. $10 per child includes a lesson, a 250g punnet of self-picked strawberries and a strawberry ice cream. Contact Peter on 0429 385 284 for bookings. Allow one hour, plus extra if you wish to include your own activities like a bush walk, mini golf or ball games in the picnic area. The most interesting time of the year with the sheep is in March when it is lambing time. With 40 ewes having mostly twins and some triplets, the kindergarten of lambs is cute and funny! Manauri the alpaca guards the flock of sheep from dogs and foxes. Sesame and Wings the rabbits are new residents at the farm after their family moved to Brisbane and couldn't take them. Our chooks include very friendly Isa Browns, Ruby and Rose the Rhode Island Reds and 7 very shy bantams and silkies. Depending on the farm routine, you may be able to see the animals. Native birds are everywhere! Try bird watching and tick off the sheet. Early morning and at dusk kangaroos come into the farm from the adjoining Redgum National Park. 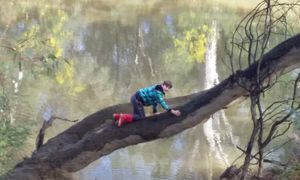 If you are very quiet you might spot a shy family of platypus in the Goulburn River. Belstack Strawberry Farm is the ideal setting off point for walks, horse riding or bike riding through the adjoining Redgum National Park. Fishing in the Goulburn River is a favourite pastime also. 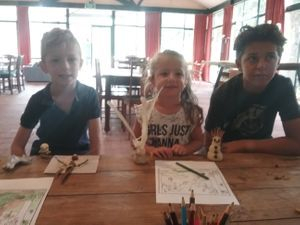 Rest and recover in the Farm Cafe with toilet facilities available. We reckon if the kids are happy, everyone is happy! 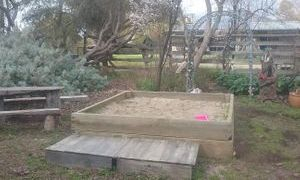 The picnic area near the shop has a sandpit for lots of fun. The picnic areas below the carpark are shaded by the Redgums and handy to the gate for bush walks after lunch.